Trafo is the brand for the best-quality, pure, organic chips. Trafo has been a trusted name in this segment for more than 30 years. You can see this long history in the care we take when selecting our organic potatoes, the passion and skill with which we treat these potatoes and, above all, the quality and taste of our end product: delicious and responsible organic chips from Holland! This has been our message for more than 30 years and, together with other passionate enthusiasts (farmers, producers, retail players), we contributed to laying the foundations for what is now referred to as the natural food channel. With pride and full of ambition, we continue to build on this piece of history, fully convinced that we are contributing to a better world. We produce a wide range of products at our state-of-the-art chips factory. With our modern production lines and skilled staff, we are able to bake at a low temperature, which has a positive impact on the quality of the chips and the oil in which they are baked, whilst our defatter allows us to keep the fat content of our chips to a minimum. The traditional Trafo chips have the familiar taste and texture you hav e known for years. Made from the best quality organic potatoes, deliciously thinly sliced and with no additives. Our range of h andcooked chips have a recognisable, pure flavour and a characteristic, crunchy bite. These chips are cut slightly thicker and fried in batches. Our master bakers determine when the chips are perfectly cooked based on their expertise and years of experience. Our Heart Chips are a range of chips for health conscious consumers. This range includes low fat, maximum-taste vegetable chips and potato chips baked in a patented vacuum oven, chips without salt and chips baked in coconut oil or olive oil, for example. Alongside an extensive range of organic (potato) chips, the total Trafo product rang e includes a wide variety of other chips and snacks. 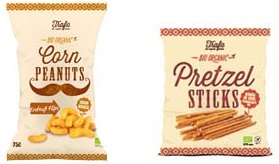 These include Tortilla Chips, Corn, Peanuts, Popcorn and Pretzel Sticks. If you would like further information, are interested in including items from Trafo in your range or already sell Trafo and are looking for a product specification, pack shot or other information, please email info@fzorganicfood.com.